A Nerd's Game is a mind-blowing math quiz for iPhone/iPad/iPodTouch. Today the new version (3.0.0) of the Euro coin collecting software So Many Euros was released. This version includes this year's 2 € commemorative coin issues of Belgium, Greece, Italy, San Marino, Slovenia, and Spain. Due to the silver price ralley German Ministry of Finance announced that the issue of 10€ silver coins (Ag 625, Cu 375) in BU quality will be terminated. In the future 10€ coins in BU quality will be issued in copper/nickel. 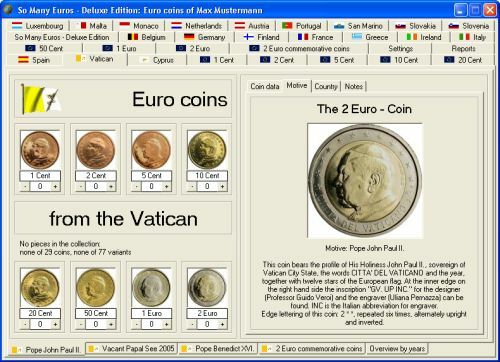 New version of Euro coin collecting software "So Many Euros" released. So Many Euros is the software for all Euro Coin Collectors. It contains all circulation coins from 1 Cent to 2 Euro and the popular 2 Euro commemorative coins. All countries (also Cyprus, Malta, Slovenia and Slovakia), all different sets (eg Vacant Papal See from the Vatican), all years and all stamping places are supported, all together more than 1,660 variants. Do you like exchange coins with me? I'm looking for someone who can sell me rolls of 2 euro commemorative of Germany. I saw you live in Germany, can you be my supplier? My e-mail address is: sylvialoo@quicknet.nl. For me the mint place of the 2 euro coin isn't important. I am Dutch euro collector. Germany 2 euro 2009 e.m.u. I could help you with Dutch euro coins.